For a brief introduction video, watch our short video. One of the major railway infrastructure research thrusts within the Rail Transportation and Engineering Center (RailTEC) at the University of Illinois at Urbana-Champaign (UIUC) are concrete crossties and fastening systems. Researchers focusing on concrete crosstie and fastening system research believe it is critical to conduct research that provides both academic value and positive impacts to the railway industry. 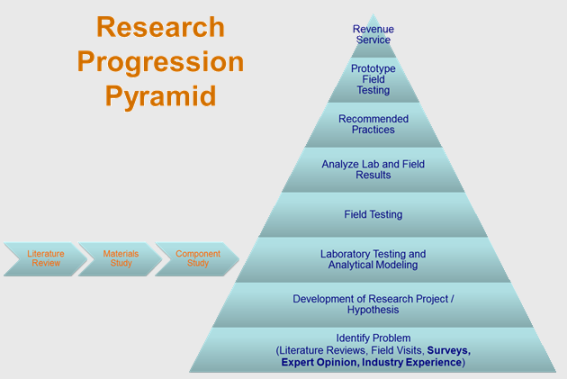 The research framework that is used by the group is shown in the Research Progression Pyramid below. Through conversations with industry experts and researchers, surveys of the international railway community, and prior research experience, we develop Research Needs. These needs ultimately lead to research projects when there is sufficient industry support. One of the deliverables that is a primary thrust of all these research projects is to have the results from each project to lead to continued improvement of the American Railway Engineering and Maintenance-of-way Association (AREMA) recommended practices for the design and maintenance of concrete crossties and fastening systems. Researchers within RailTEC believe it is important to focus on the concrete crosstie and fastening system as a “system”. To address the entire system, we have projects aimed at components and materials that make up these systems, giving us a holistic approach at solving problems that create system-level challenges for railway infrastructure maintainers. By taking this system-level approach, the entire system will be improved and not just a single component within it.